CW3E collaborator Nina Oakley, along with CW3E director Mary Ralph and others recently published a study in the American Meteorological Society journal, Earth Interactions. The study is titled “A 22-Year Climatology of Cool Season Hourly Precipitation Thresholds Conducive to Shallow Landslides in California” and explores hourly rainfall observations throughout the state through the lens of precipitation as a trigger for shallow landslides. Storm-triggered shallow landslides are a common hazard in California’s complex terrain. Where they mobilize into debris flows, they can have devastating impacts on life, property, and infrastructure. Most landslide-susceptible slopes require some amount of antecedent precipitation before intense rainfalls may generate the pore pressures thought to trigger shallow landslides. Post-wildfire debris flows, like the 9 January 2018 event in Montecito that claimed 23 lives, can be triggered by a host of other processes that involve direct runoff from hillslopes. All of these types of mass movements require moderate to high intensity rainfalls whose intensities exceed local infiltration rates. Our research is thus relevant to a broad category of geologic processes (landslides, runoff, runoff-generated debris flows, etc.) that threaten California’s welfare. There are implications of this work beyond landslides; results may inform reservoir operations, floodplain management, and public safety. Historic records of landslide occurrence in California document many events within populated areas such as the San Francisco Bay Area and Transverse Ranges of southern California. There are far fewer records from outside these regions. 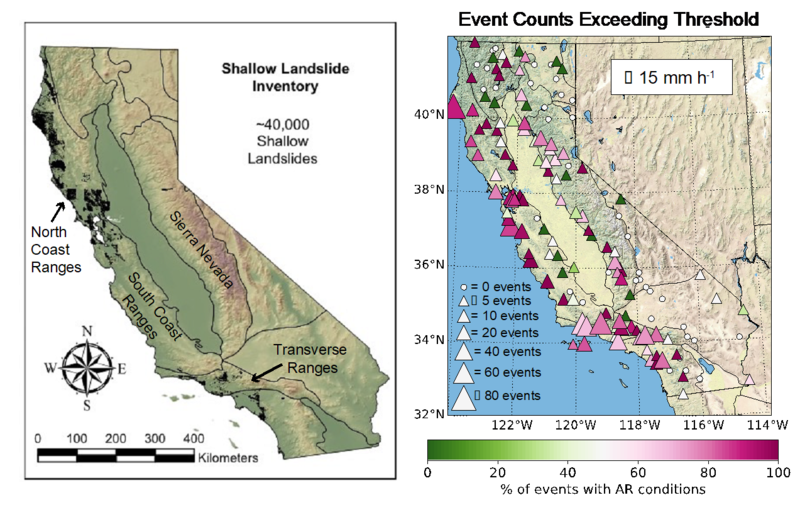 One hypothesis for the distribution of observed landslides is that some areas of California do not frequently experience rainfall of sufficient intensities and durations to trigger shallow landslides. We tested this hypothesis by documenting where hourly rainfall in the cool season (October-May) in California met or exceeded published values thought to trigger landslides after a seasonal antecedent precipitation threshold has been met. The thresholds examined were 5, 10, 15 and 20 mm h-1 as well as 7.5 mm h-1 for 3h, and 5 mm h-1 for 6h. We also evaluated the relationship between these events and atmospheric rivers. We develop an hourly precipitation data set for this analysis by applying quality control to a 147 Remote Automated Weather Stations (RAWS; raws.dri.edu) across California over a 22-year period. Our analysis shows that stations with exposure to southerly atmospheric flow in the Coast and Transverse Ranges experience high numbers of over-threshold events at all intervals, coincident with areas with the greatest number of observed landslides. Our results also highlight areas where over threshold events frequently occur but landslide observations are lacking; one such region is the northwestern Sierra Nevada. In the regions experiencing the highest number of over-threshold events, approximately 60-90% (depending on threshold examined) are associated with atmospheric rivers. The number of over threshold events varies greatly both within a season and inter-annually, though the greatest frequency tends to coincide with the climatological wettest month of the year. Individual storm events commonly It is feature multiple over-threshold events, especially at lower intensities or multi-hour thresholds. Our study brings together atmospheric scientists and geologists. Co-authors include Jeremy Lancaster and Stefani Lukashov from the California Geological Survey, Ben Hatchett and Shawn Roj form the Desert Research Institute/Western Regional Climate Center, and John Stock from the US Geological Survey. This study was supported by the California Department of Water Resources, the National Oceanic and Atmospheric Administration’s Climate Program Office through the California Nevada Applications Program, and the National Aeronautics and Space Administration through the Nevada NASA Space Grant Consortium. Landslide observations and frequency of intense precipitation. Left: Shallow landslides compiled by the California Geological Survey are shown as black dots. Geomorphic provinces are overlain on the map. The four provinces most pertinent to the study are labeled. Right: Marker size indicates the number of precipitation events exceeding 15 mm h-1 during the October-May period 1995-2015 at each RAWS station. Marker color indicates the percentage of total 15 mm h-1 events associated with atmospheric river conditions.